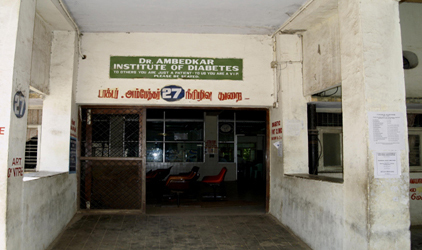 The Department of Diabetology was started in Government Kilpauk Medical College and Hospital in the Year 1967 and is taking care of Diabetic Patients particularly those from the lower socio economic class of society. Diabetes was once thought as a disease of rich people and a common man cannot afford for his treatment. This statement was proved wrong by the Department and attracted the poor people for Diabetes care. Because of the care and commitment by professionals trained in Diabetes working in our institution, the census of Diabetic people attending our Department has increased day by day. 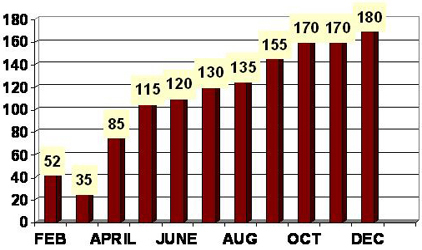 The Diabetic OP which started in 1967 with less than 100 patients a day has grown steadily and at present nearly 1000 patients attend the OP every day. 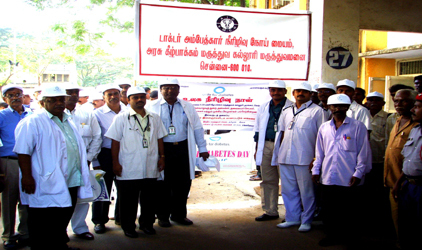 It stood as a pillar in Diabetes care among all Government Hospitals in Tamil Nadu. The Department was upgraded to an Institute in the year 1983. 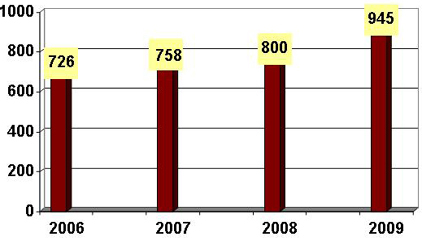 At present our Department caters to 800 to 1000 outpatients per day. 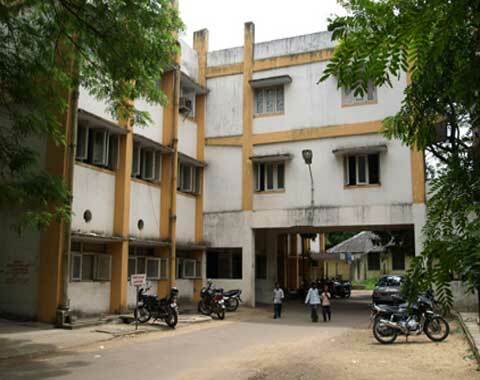 The department has a separate Bio-Chemistry laboratory for the Diabetology Department with quality control in association with the Bio-Chemistry Department of Christian Medical College Hospital Vellore. The Lab is functioning under the guidance of one Assistant Professor of Bio-Chemistry with one Non-Medical Assistant and four Lab Technicians. 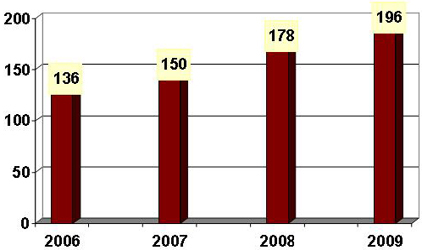 Number of blood sugars checked through venous samples is about 200/day. The lab also has facilities for various blood tests such as Urea, Creatinine, Cholesterol, Urine analysis, which are helpful to identify various Diabetes related Complications at an early stage. At present nearly 200 Type 1 Diabetic patients (Insulin Dependent Diabetes Mellitus) are registered in this clinic and they receive free insulin provided by the Government for home use. These young people attend frequent patient education programme and complication detection camps organized by the Department periodically. Diabetes affects the nerves and blood vessels of the foot more commonly. This leads to foot ulcer and subsequently to loss of the limb. Amputations among Diabetic patients are high in our country due to poor foot care and bare foot walking especially among poor people. 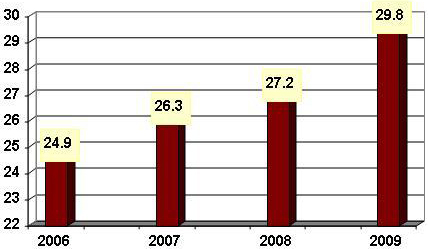 To overcome this problem and to prevent the amputation, the Preventive foot care clinic was started with the help of World Diabetes Foundation in March 2004. The clinic runs on all working days and nearly 10 - 20 patients are being screened every day with help of instruments such as Bio- thesiometer and Doppler to detect Neuropathy and Peripheral Vascular Disease. 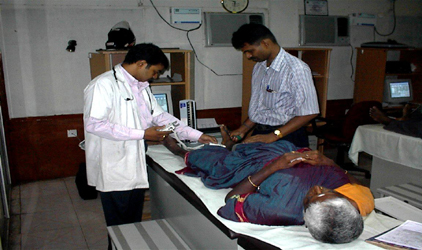 Screened patients are given detailed computerized report about their foot status. The proper way to foot care and importance of foot wear, MCR Chappals, dos and don’ts of their foot are being taught at the end for every patient. There is Group Counseling and Individual Counseling for selected patients. This preventive Foot care clinic is the first of its kind in any Government Hospital in Tamil Nadu. We hope that this will go a long way in preventing Foot amputations in future among Diabetic patients. 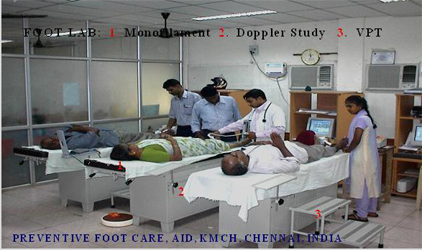 The Diabetic patients who have developed Foot ulcers are treated under the same roof of our Department. Foot Ulcer clinic works on all Tuesdays and Thursdays between 10-12 noon in association with Plastic Surgery Department. One Assistant Professor trained in foot ulcer management from plastic surgery department takes care of the wound treatment. 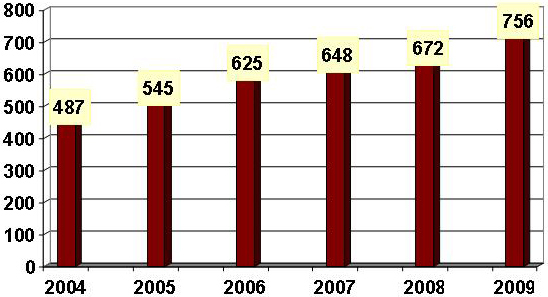 This has reduced the limb amputations among the diabetic patient. 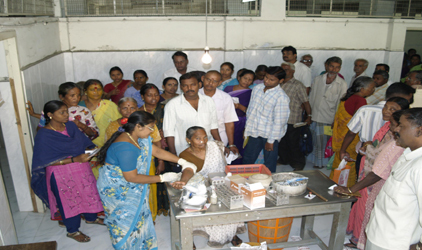 The care is continuing and till date about 10-15 patients attend the Foot Ulcer Clinic on OP Days. The department takes care of the diabetic feet before the emergence of foot ulcer. The feet are cared by trimming the nails, removal of calluses, corns etc. A male nurse trained in podiatry takes care of the podiatry clinic. Again this Diabetes podiatry clinic is also the first of its kind in the Government sector in our State. This clinic runs on all Tuesday and Thursday along with foot ulcer clinic in our department. Patients with diabetes are screened for Cardiac disease once they are registered. Baseline ECG and Serum Cholesterol are taken and proper treatment initiated. For special deserving cases, Cardiac Autonomic Neuropathy is being assessed by special instrument. For already registered patients, a routine check-up is being done clinically. For them ECG is being taken every year .If they have heart Disease they are referred to Cardiology for Echo and expert management. Our Department is equipped with a special instrument CANS 504 (Cardiac Autonomic Neuropathy System Analyser) to assess the cardiac autonomic neuropathy in Diabetic patients. Since Silent heart attack is most common in diabetic patients, this provides a boon for the poor patients who are at risk. This instrument is valuable in diabetic patients who are undergoing major surgeries in Government Kilpauk Medical College and Hospital. Diabetic Emergencies are admitted in IMCU and ICCU where the diabetes care is rendered by the Department faculties. Diabetes affects Retina, which may lead to permanent loss of vision. 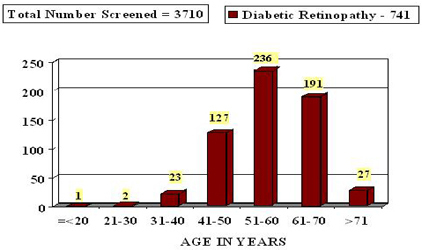 Diabetic Retinopathy may be present even at the time of Diagnosis of Type 2 Diabetes. Hence it becomes mandatory to rule out Diabetic Retinopathy at the time of diagnosis. All the newly detected cases in our department are screened for diabetic retinopathy by the Department of Ophthalmology at Government Kilpauk Medical College and Hospital. For those who were already screened undergo periodic check-up every year at our department. For the registered follow up cases, our Department conducts Eye camp frequently with the help of Lions Club and Sankara Nethralaya. 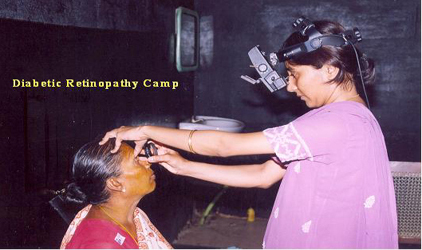 Deserving patients are saved from loss of vision by giving free laser treatment. As already mentioned, newly detected cases are screened for nephropathy by assessing blood for urea and creatinine; urine for albumin at the time of registration. 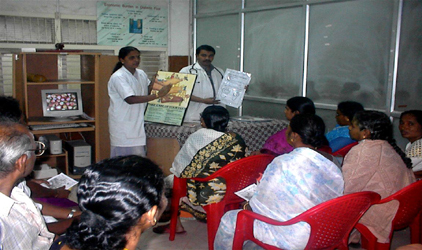 Health education regarding diabetes and screening regularly for complications are taught to them. For the already registered patients at our department, annual screening for nephropathy is also done. Those who have developed kidney disease are referred to Nephrology for special care. 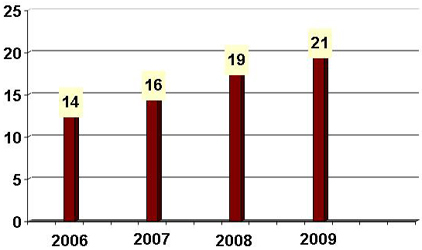 Thus the care for diabetes for kidney disease is done regularly. As there is increase in the prevalence of Diabetes among young adults, Diabetic women in the reproductive age group are counseled regularly. If they plan for conception, the need for good sugar control before and during the pregnancy is stressed through health education. All Pregnant women are screened for diabetes at various time of their conception. The patients developing diabetes first time are given proper health care and diabetes control provided. To reduce the economic burden for them, our department is providing free insulin and assisting them to deliver a healthy child without any complication to mother and child. After delivery, these patients for whom the blood sugar comes to normal are prone to develop diabetes later in their life. So the follow up for this high risk is done periodically. The department provides diabetes related education on diet, exercise, treatment initiation and follow-up, insulin devices and delivery methods, early detection of diabetes complication for both Under graduate and Post graduate students. Our department guides the M.D postgraduates to carry out their dissertation work in Diabetes and its allied complications. The department gets engaged itself in presenting rare and interesting cases in Diabetes in clinical meetings, CME for educating the under and post graduates from various specialty in our hospital. Every week journal club is conducted at the department and various new advances and emerging new modalities of treatment are discussed. The T.N. Dr. M. G. R Medical University, Chennai has recognized the HOD and Professor of Diabetology and the department of Diabetology in KMCH for Ph.D. At present two persons from nursing faculty are in the process of registration for Ph. D with the guidance of The Head of the department of Diabetology. 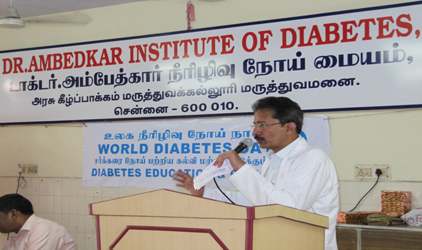 The training program is conducted at Dr. Ambedkar Institute of Diabetes for a period of Three months. 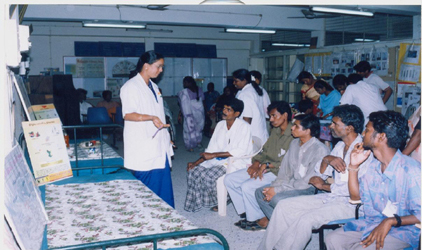 Nurses from various Government Hospitals throughout the states are sent on deputation for this training program. 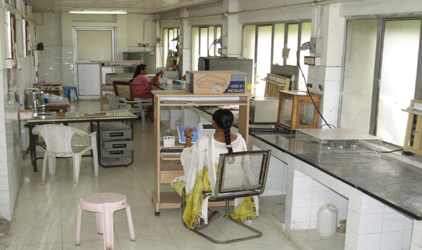 So far 18 batches have been trained in this department and this is an ongoing programme. Once these peoples on return to their own hospitals, they will help the doctors there in providing better care for diabetes patients. Patient’s education forms the roof in the diabetes care. Without education the patient care is incomplete. 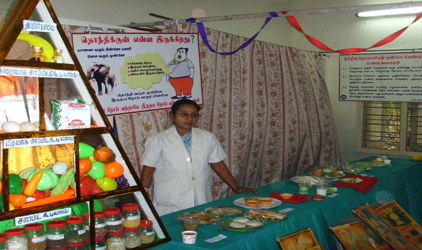 So the department educates the patient through a dietician attached to the department daily. The focus of Education is mainly on Diet, Exercise, Frequent Blood Sugar Monitoring and Early Detection of Diabetic Complications. Education is given to patients while they wait for the blood sugar results.